You'll end up with extra pickles and sauce, which can be put to good use. When buying fennel, check the root ends to make sure they are freshly cut. 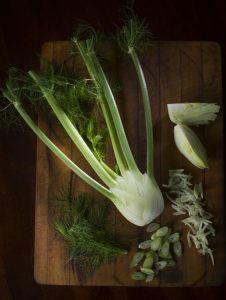 And if you plan to slice your fennel ahead of using it, dunk it in acidulated water to keep it from turning gray. You will have extra pickles and sauce when you use up this soup. Put the former on a cheese plate and use the later drizzled over grilled fish. Fennel – bulb, stalks and leaves – prepped for the soup, which is served chilled. A concoction including vinegar, honey, lemon zest and coriander is poured over the sliced fennel stalks. Once it is cooled and refrigerated overnight – voila – you have fennel pickles. To make the soup, simmer 3 cups of water, the stock and the dark green parts of the leeks in a medium saucepan over low heat for 20 minutes. Strain. Save the chicken-and-leek stock and compost the leek tops. In a Dutch oven over medium low heat, melt the butter and add the white and light green parts of the leek, fennel bulbs, fennel seeds, garlic, 1/2 teaspoon salt and 1/4 teaspoon black pepper. Cook, stirring occasionally, until vegetables are tender, about 10 minutes. Add the reserved chicken-and-leek stock and simmer for 20 minutes more. Using either a hand or a stand blender, puree the soup. Season with salt and pepper to taste. Chill overnight. Add salt to taste and stir in liqueur, if using. 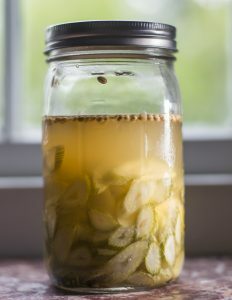 To make the pickles, place sliced fennel stalks into a quart mason jar. In a small saucepan over medium heat, combine 1 cup water, the vinegar, honey, zest, fennel and coriander seeds and black pepper. Simmer for 5 minutes. Pour into the jar over the fennel. Cool to room temperature, cover and refrigerate overnight. To make the sauce, combine the fennel fronds, parsley, tarragon, scallions, olive oil, lemon juice and chili pepper flakes in a blender until smooth. Season with salt and pepper. Let sit 30 minutes before serving. To serve, ladle the chilled soup into bowls, swirl in a spoonful of sauce and garnish with pickled fennel stalks.